They’re the primary stores at malls. Toys “R” Us, which filed for bankruptcy protection last September, had, not unexpectedly, a terrible holiday selling season. The holiday season would have been key for its survival in restructured form, and so it’s spiraling into oblivion. It already obtained court approval earlier in February to close 182 stores in the US and shed 4,500 workers along with them. Now it plans to close another 200 stores in the US and lay off more people, the Wall Street Journalreported last night, based on its sources. After the new round of store closings, the retailer will have slashed its footprint in the US by about half since the bankruptcy filing. 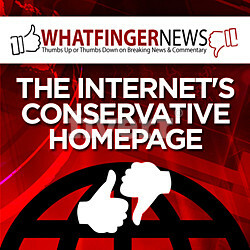 Part of the blame goes to its inability – overburdened by debt as it was – to build a vibrant online presence. 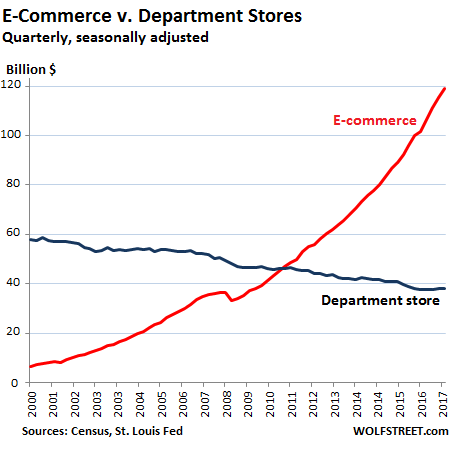 Nevertheless, people still say that e-commerce is only a small-ish part of overall retail, and that it’s therefore really no big deal. In Q4, the e-commerce share of retail was 9.1%, though up from 8.2% a year ago. 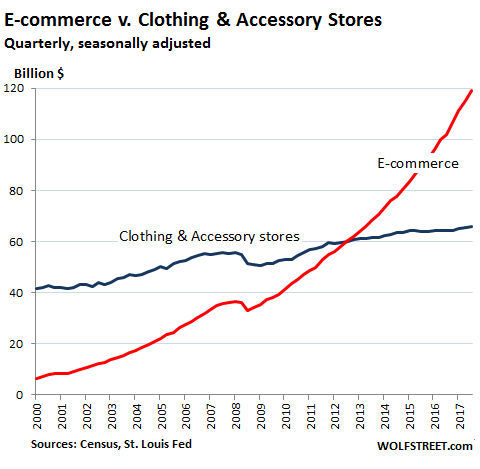 But e-commerce sales in the fourth quarter soared nearly 17% from a year ago – the largest jump since Q1 2012 – to a new record of $119 billion. 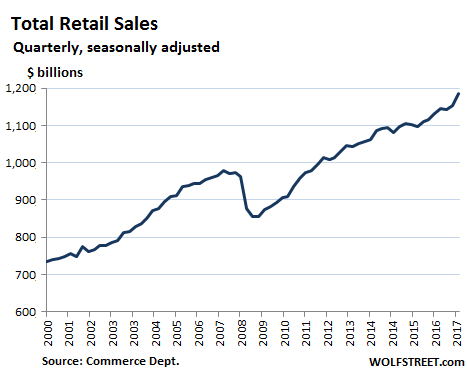 Among the remaining 49% ($575 billion in Q4), some categories of retailers are holding on, but others have been getting crushed, and the list of those getting crushed is growing. 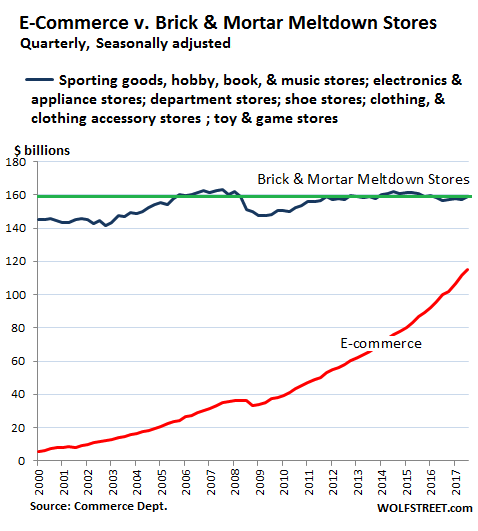 Sporting goods, hobby, book, music, toy, and game stores: sales are down 1% over the past 10 years, despite inflation and population growth. 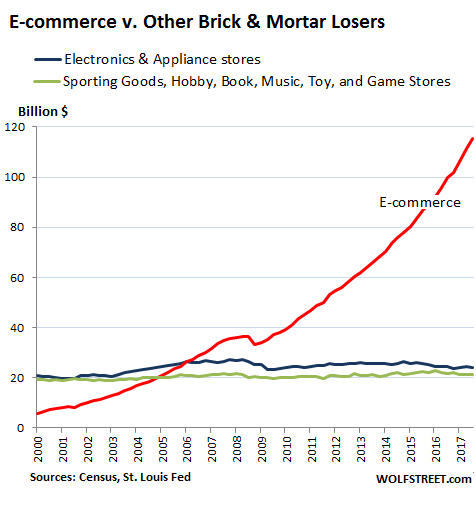 These are the sectors that have been losing the battle against e-commerce, starting 20 years ago. E-commerce will spread deeper into other categories as consumers become ever more comfortable buying things online that they didn’t used to buy online. This conversion is happening constantly, as consumer preferences and technologies change. Many of the stores in those categories, like music stores before them, will essentially disappear over the next few years. And these stores are the primary occupants at malls. For many mall landlords – despite what they may claim publicly – this means that they will have to find some other purpose for that piece of land. But that process doesn’t happen overnight. It took 20 years to get this far, and it will take many more years of upheaval before some sort of equilibrium will be established among the survivors.